Planned Parenthood founder Margaret Sanger spoke to the Klan and supported eugenics. So why does the organization still honor her? Planned Parenthood founder Margaret Sanger spoke to the Ku Klux Klan and supported eugenics. So why does the organization still honor her? The media seems to be doing an effective job of condemning many people who have an association with the Klu Klux Klan — but one exception to this seems to be Planned Parenthood’s “beloved” founder, Margaret Sanger. Margaret Sanger is usually described as a “birth control pioneer” who founded Planned Parenthood, but she also met with members of the Klan, advocated eugenics, and supported the use of sterilization to rid the planet of the “unfit.” Sanger wrote about her meeting with the Klan in her autobiography. Yet somehow this fact is made light of, glossed over, or completely ignored by the media. I accepted an invitation to talk to the women’s branch of the Ku Klux Klan…. I saw through the door dim figures parading with banners and illuminated crosses…. I was escorted to the platform, was introduced, and began to speak…. In the end, through simple illustrations I believed I had accomplished my purpose. A dozen invitations to speak to similar groups were proffered. 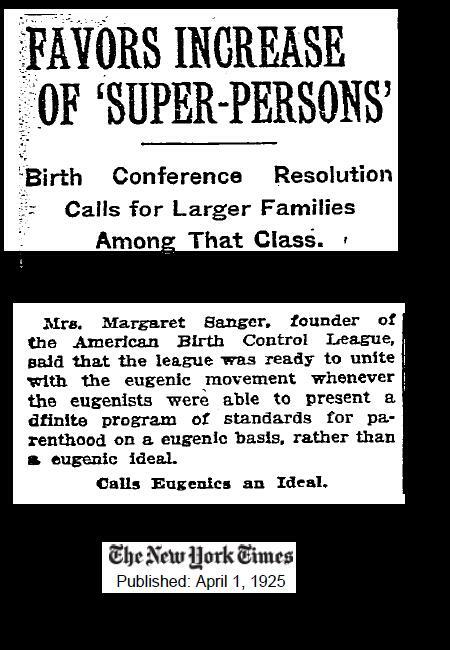 What about Sanger’s outspoken support for eugenics? While some may not be entirely familiar with the meaning of “eugenics,” it’s likely that those same people have seen it in action in various ways. Coined in the mid 1800’s by Francis Galton, the cousin of Charles Darwin, eugenics was a popular movement to create a society in which those who were considered “superior” would reproduce… while those who were deemed “inferior” would be encouraged not to reproduce. Tragically, this movement was credited with forcefully sterilizing many men and women. 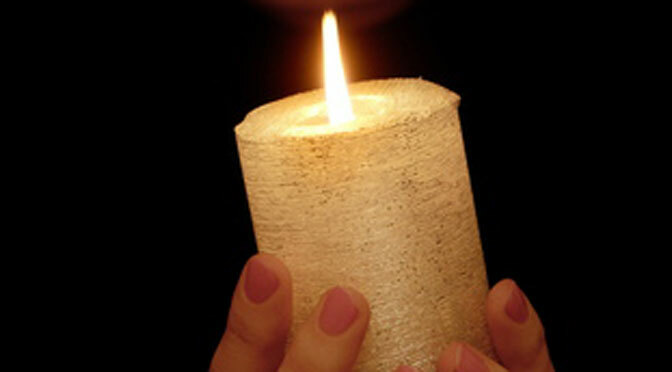 The targets of these horrendous acts were disproportionately Black and poor, according to many reports. 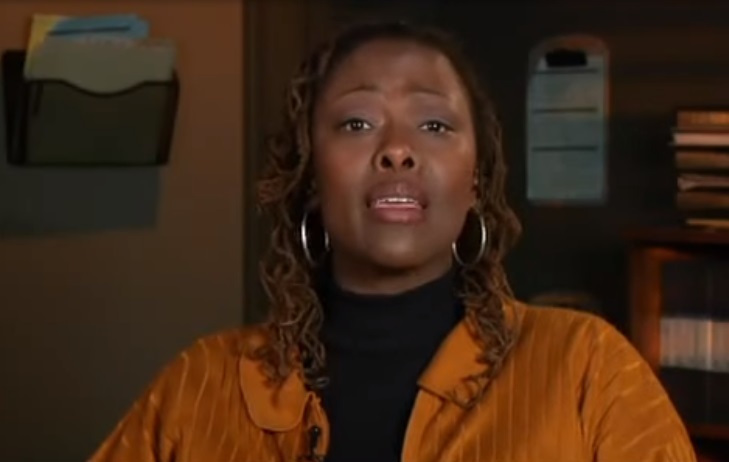 Eugenics victim Elaine Riddick speaks in the video below about being “cut up like a hog,” thanks to the philosophy of eugenics. Riddick, like some other Black citizens, was forcibly sterilized in North Carolina in 1968. Her tearful testimony encouraged state lawmakers to vote for reparations for those like her, who were eugenically sterilized. So how does this relate to Planned Parenthood founder, Margaret Sanger? One of the prominent supporters of that horrific eugenics program was Clarence Gamble, and Gamble was a director of Margaret Sanger’s American Birth Control League, which later changed its name to Planned Parenthood. We who advocate Birth Control, on the other hand, lay all our emphasis upon stopping not only the reproduction of the unfit but upon stopping all reproduction when there is not economic means of providing proper care for those who are born in health. …While I personally believe in the sterilization of the feeble-minded, the insane and syphilitic, I have not been able to discover that these measures are more than superficial deterrents when applied to the constantly growing stream of the unfit… Eugenics without Birth Control seems to us a house builded upon the sands. It is at the mercy of the rising stream of the unfit…. 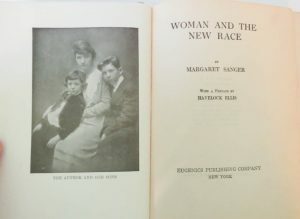 Sanger was more than just a passive observer where eugenics was concerned; she was a member of the American Eugenics Society and even tried to unite her efforts and her publication with the eugenics movement. 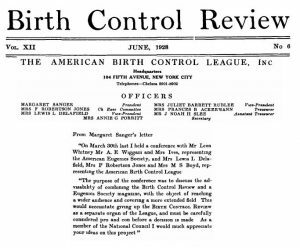 This image below captures a letter entitled, “Shall the Birth Control Review be combined with a Eugenics Magazine?” written by Sanger. It was published in the June 1928 edition of her Birth Control Review and it details her meeting (page 188) with American Eugenics Society representative, Leon Whitney, to merge her publication with that of the Eugenics Society. Whitney was the former Executive Secretary of the American Eugenics Society (AES) and Sanger published his writings in the Birth Control Review (BCR). 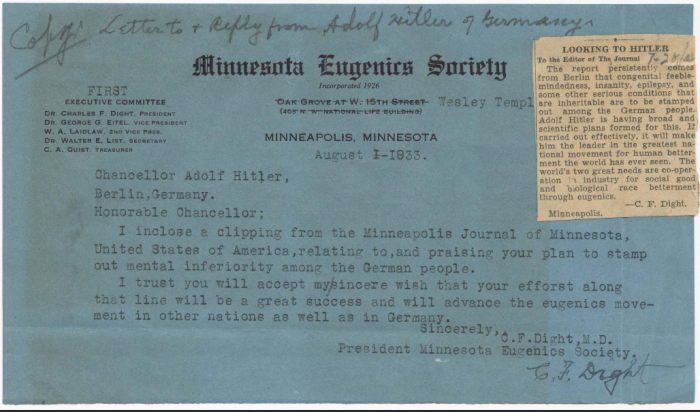 Of interest is that fact that, Nazi leader Adolf Hitler was so influenced by Whitney that he sent him a letter complimenting him for a book he had written on sterilization. Mrs. Margaret Sanger, founder of the American Birth Control League [ABCL], said that the league was ready to unite with the eugenic movement whenever the eugenists were able to present a definite program of standards for parenthood on a eugenic basis, rather than a eugenic ideal. 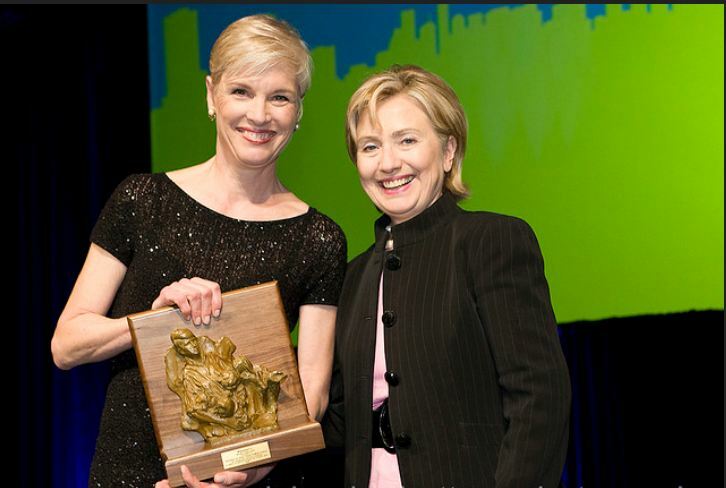 Since the 1960’s, Planned Parenthood has granted its infamous Margaret Sanger Award (calling it their top award) to people who benefit the organization’s cause. Today, Planned Parenthood will defend their founder by pointing to civil rights giants like Martin Luther King, Jr., who also received the Margaret Sanger award. But the full picture and agenda of Sanger and her Planned Parenthood organization were not obvious to many in the Black community at that time, including MLK. Given this information and much more, when will the media demand recipients of this hideous award return it to Planned Parenthood? And, even more important, when will Congress cut ties with Planned Parenthood and stop sending them half a billion in tax dollars every year? 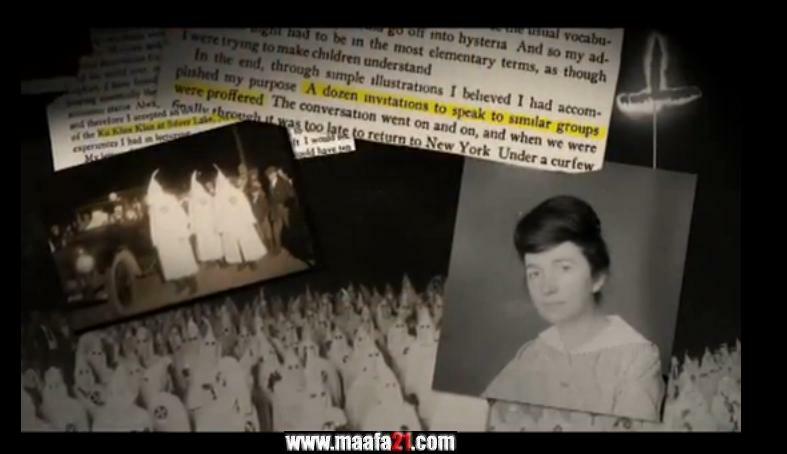 With the topic of America’s history in racism once again a focus in the news, a fake image of Planned Parenthood founder Margaret Sanger speaking to the Klu Klux Klan has been circulating online. 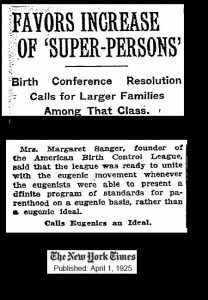 While the image is not real, what is quite real is the fact that Sanger, a proponent of eugenics, spoke to a meeting of the women’s branch of KKK in 1926. That being said, the image below, which purports to show Sanger giving that speech before her adoring Klan supporters is not authentic. The image was part of a blogger’s photo contest. Sanger and Klan image was part of blog photo contest in 2005 — it is not authentic. But Sanger’s views were so outrageous in and of themselves that there is no need to circulate inaccurate depictions, which could lead to attempts to discredit her meeting with the Klan altogether. Sanger has a very controversial history as an enthusiastic proponent of eugenics and a member of the American Eugenics Society. This philosophy not only fed her work within the Planned Parenthood movement, but her lesser known advocacy of euthanasia as well. 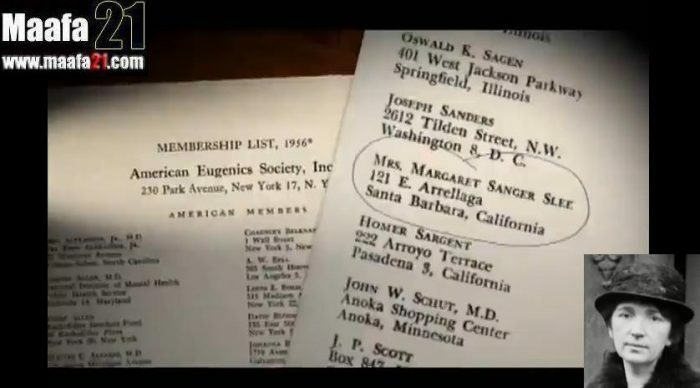 The organizations Sanger founded, such as The American Birth Control League (ABCL) and later, Planned Parenthood, also have ties to many eugenics proponents. One of those connections was a man by the name of Clarence Cook Little. According to a biographical memoir published by the National Academy of Sciences, Little held various distinguished positions. He was the president of the University of Maine and of the University of Michigan, and he was the managing director of the American Society for the Control of Cancer. He was named the director of The Jackson Laboratory and later accepted a position as scientific director of the Tobacco Industrial Research Committee. He was also a member of the American Academy of Arts and Sciences and the National Academy of Sciences. Sadly, Little was also president and founding member of The American Eugenics Society, as well as a board member of Margaret Sanger’s American Birth Control League. He was also the Birth Control Federation President, and sat on the previously mentioned American Euthanasia Society board. 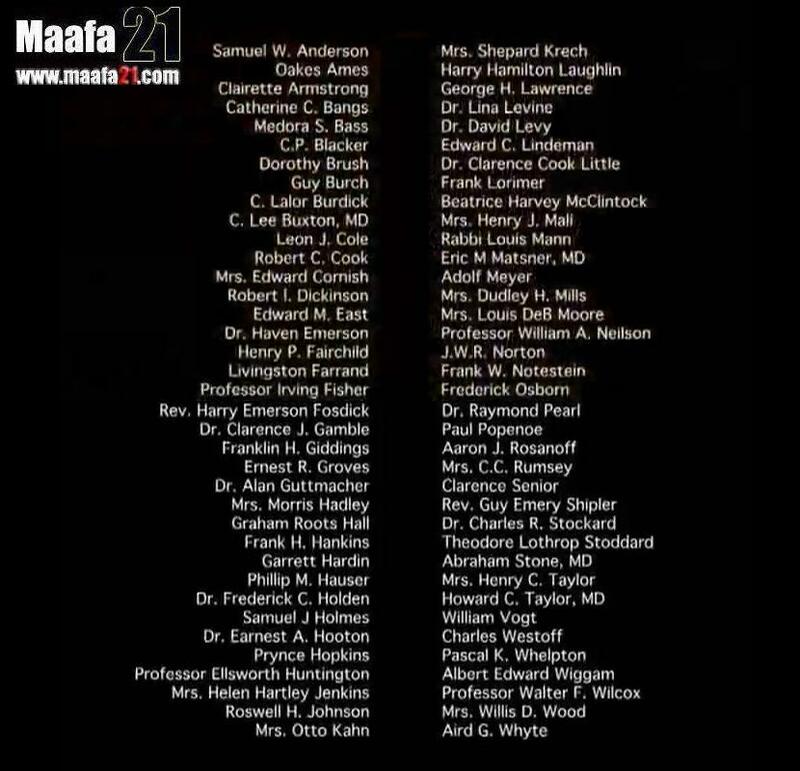 Little was also listed on the 1938 Committee for Planned Parenthood. There is a building (and a bus stop) on the University of Michigan campus named for Clarence Cook (C.C.) Little. 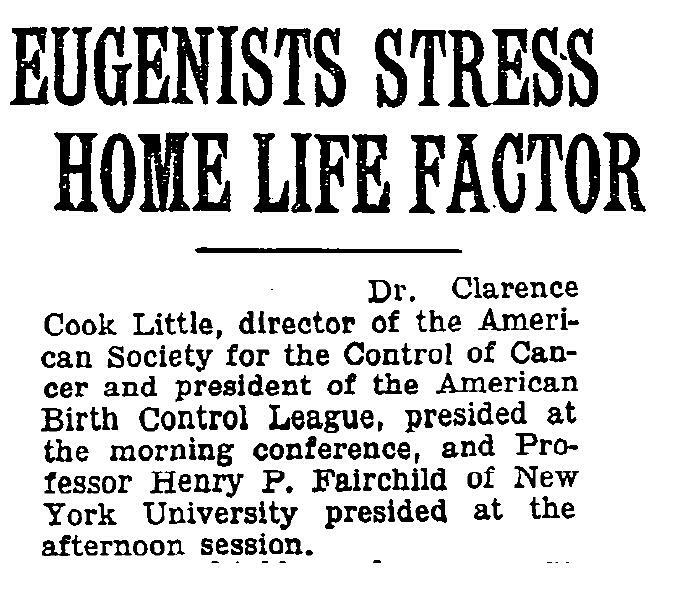 He was the University’s president in 1925, and an outspoken “scientific” racist and eugenicist, who believed that “inferior” races should undergo involuntary sterilization. I often sat at the bus stop bearing his name while I waited to go to class. Little would have hated that. Despite the merit of these denouncements, few have expressed concern over Little’s ties to Planned Parenthood’s history. 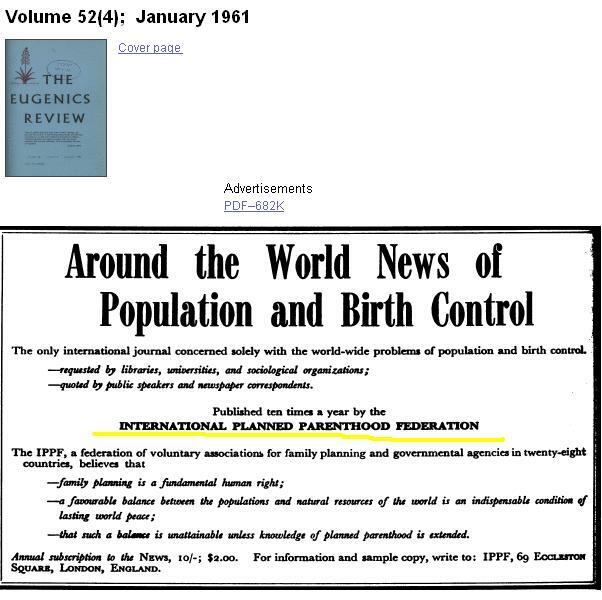 Another interesting eugenics connection to both Sanger and Planned Parenthood is a woman by the name of Hilda Kahlert Cornish. Hilda Cornish chaired the Arkansas Eugenics Association. 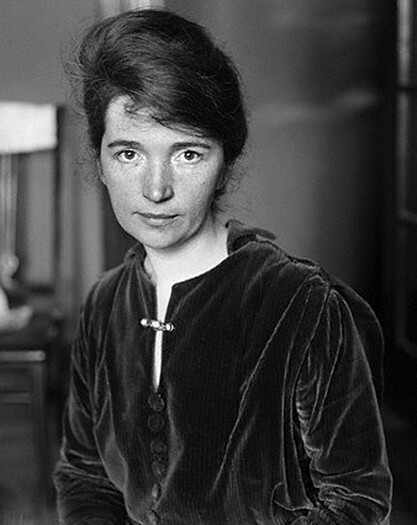 According to a 1986 article in an Arkansas newspaper, Cornish received much of her counsel directly from Margaret Sanger. In fact, the Blytheville Courier Press notes that the sons of the two leaders were roommates at Yale University. From its beginning, Planned Parenthood always had powerful ties to the American Eugenics community. In fact, in many places they were often one in the same. For example, when the first birth control clinic was opened in Arkansas, it was operated by the Arkansas Eugenics Association and overseen by a woman named Hilda Cornish. Later, the Arkansas Eugenics Association would become the Arkansas State Affiliate of Planned Parenthood and Cornish would be named its executive director. Documents obtained by Live Action News confirm this fact. A 1945 Planned Parenthood directory reveals that Mrs. Edward Cornish was the director of the Planned Parenthood Association of Arkansas. Cornish was active with the Democrat Party and married to banker Edward Cornish, according to Arkansas historians. She is also listed as a member of the American Eugenics Society. 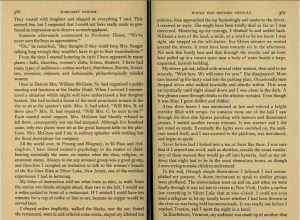 In the summer of 1930, [Cornish] met Margaret Sanger… The two developed a friendship maintained by correspondence and occasional meetings. During that summer, Cornish visited Sanger’s Clinical Research Bureau in New York, and she launched the Arkansas birth control movement later that same year. At Cornish’s initiative, a group of physicians, business and religious leaders, and women active in civic work formed the Arkansas Eugenics Association (AEA)…. In early 1931, the association opened the Little Rock Birth Control Clinic in the basement of Baptist Hospital…. Cornish also worked with the National Committee on Federal Legislation for Birth Control. 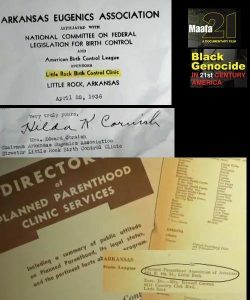 The online historical site added that in 1942, The Arkansas Eugenics Association changed its name… to the Planned Parenthood Association of Arkansas. 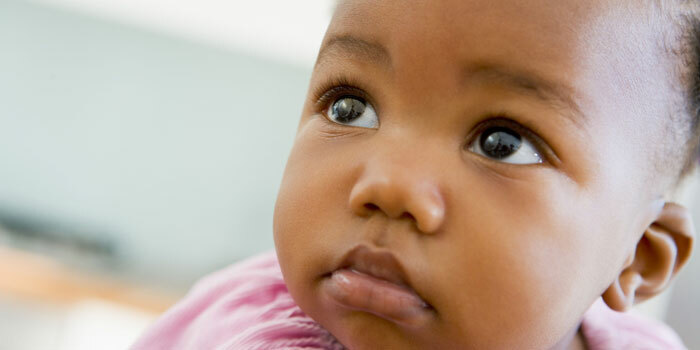 The authors add that “until 1937, only white women actually had the opportunity to receive services” and the organization “held separate hours for white and African American women.” The book also notes that “most of [the American Birth Control League’s] clinics were segregated.” The ABCL later changed its name to Planned Parenthood. Planned Parenthood’s beloved founder Margaret Sanger reached out to many people who saw Blacks as less than equal, and this includes the Klan and the Eugenics movement. Today, many believe that Sanger’s racist ideologies have penetrated much of her work. And even without an image to document Sanger’s speech before the Klan, Planned Parenthood knows her history, as revealed in her own autobiography. 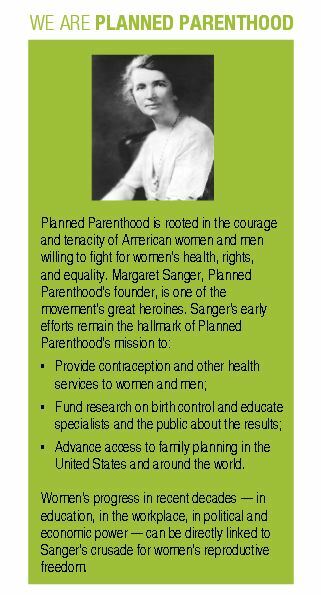 Instead of repudiating Sanger, taxpayer-funded Planned Parenthood honors her as a hero, naming their most prestigious award after her. It’s despicable. Are Sanger’s eugenic efforts still a hallmark of Planned Parenthood’s mission? In celebrating their 100th birthday, Planned Parenthood supporters continue to praise their founder Margaret Sanger (even featuring her on their 100 year website) while simultaneously attempting to distance the organization from her eugenicist beliefs. The problem is that they continue to hold Sanger up as an icon, despite her support of one of the most demeaning ideologies of recent centuries. In celebrating their 100 year anniversary, Planned Parenthood says (as pictured above) the organization “was founded on the revolutionary idea that women should have the information and care they need to live strong, healthy lives and fulfill their dreams.” But is this true? Was Planned Parenthood really founded on those ideas? Not quite. Now, she also dabbled in eugenics. She was not a full believer in all of eugenics, and disagreed with some of the things eugenicists believe in. But at various points in her life, she was opposed to women who she felt were incapable of being mothers from becoming mothers. 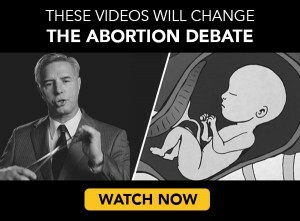 How does being “opposed to women who she felt were incapable of being mothers from becoming mothers” square with the idea that women should have “information” and be able to “fulfill their dreams,” as is advertised on the website graphic above? What if those women dreamed of motherhood? And we are supposed to believe that Sanger was some sort of feminist icon? Eugenics, which had started long before my time, had once been defined as including free love and prevention of conception. Moses Harman of Chicago, one of its chief early adherents, had run a magazine and gone to jail for it under the Comstock regime. Recently it had cropped up again in the form of selective breeding, and biologists and geneticists such as Clarence C. Little, President of the University of Maine, and C. B. Davenport, Director of the Cold Spring Harbor Station for Experimental Evolution, had popularized their findings under this heading…. I accepted one branch of this philosophy, but eugenics without birth control seemed to me a house built upon sands. Mrs. Margaret Sanger founder of the American Birth Control League, said that the league was ready to unite with the eugenic movement whenever the eugenists were able to present a definite program of standards for parenthood on a eugenic basis rather than a eugenic ideal. This letter, written by Sanger in June of 1928 and published in her Birth Control Review under the heading, “Shall the Birth Control Review be combined with a Eugenics Magazine?” Sanger details her meeting with American Eugenics Society representative, Leon Whitney, to merge her publication with that of the Eugenics Society in order to “reach a wider audience and cover a more extended field.” Whitney was the former executive secretary of the American Eugenics Society and Sanger willingly published his writings in her Birth Control Review. Planned Parenthood promoters try to convince the public that Sanger — a member of the American Eugenics Society who, by the way, also advocated for euthanasia — was simply a product of her day. But the facts paint a much different picture. Despite the evidence, Planned Parenthood’s supporters are working overtime to gloss over their founder’s beliefs. Like many great organizations, Planned Parenthood is not without its flaws. While Planned Parenthood’s founder, Margaret Sanger, was a woman of tremendous achievement, she was also a flawed and imperfect leader. She devoted her life to enabling women to have control over when and whether to have children, yet she also had beliefs, practices, and associations that Planned Parenthood acknowledges, denounces and works to redress. Michael’s words coincidentally seem to mirror Planned Parenthood’s published talking points. However, it is true that Margaret Sanger made a speech on birth control to a women’s auxiliary branch of the Ku Klux Klan in Silver Lake, New Jersey, in 1926. Sanger’s passion to spread and mainstream birth control led her to speak to any group interested in learning how to plan their reproduction. Planned Parenthood strongly disagrees with Sanger’s decision to address an organization that spreads hatred (Sanger, 1938, 366). What we say is that she did make these statements – they were wrong then and they’re wrong now. We’re not standing by anything that she said–we’re not standing by her beliefs. We are a vastly different organization now than we were when she first started the group. We’ve evolved…. What we say is her statements and her beliefs were wrong then and they’re wrong now and we don’t stand with her – we are a different organization. Planned Parenthood has a strange way of “denouncing” and “disagreeing” and not “standing by” Sanger’s beliefs — they named their most prestigious award after her. Sadly, even though Sanger’s beliefs were despicable, many journalists and politicians alike have accepted the infamous Margaret Sanger Award without hesitation. One of the more frustrating things pro-lifers hear from abortion supporters is the claim that Planned Parenthood has never been about eugenics. It is simply intellectually dishonest as well as a total denial of history to make such a claim. Such was the case recently when MSNBC’s Joy Reid defended Planned Parenthood and cut off a guest who criticized Hillary Clinton because she once admitted that she admired Planned Parenthood’s founder, Margaret Sanger. [Sanger] began to build the work of the American Birth Control League, and ultimately, of Planned Parenthood. 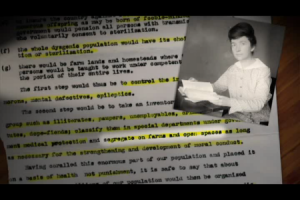 Margaret relied heavily on the men, women, ideas, and resources of the Eugenics movement. Virtually all of the organization’s board members were Eugenicists. 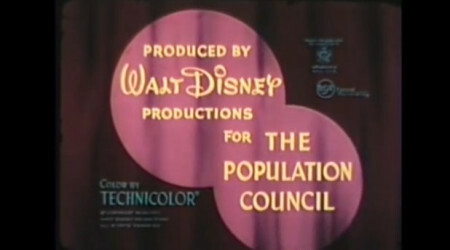 Financing for the early projects from the opening of the birth control clinics to the publishing of the revolutionary literature – came from Eugenicists. The speakers at the conferences, the authors of the literature and the providers of the services were almost without exception avid Eugenicists. And the international work of Planned Parenthood were originally housed in the offices of the Eugenics Society while the organizations themselves were institutionally intertwined for years. 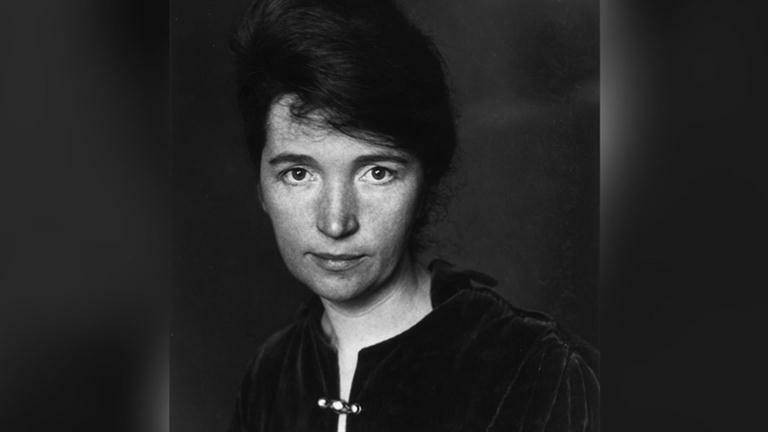 But, as abortion supporters who view Sanger as a heroine often do, they make the claim that Sanger is dead and therefore we are to simply ignore her Klan interactions, eugenics connections, rants about immigrants, push for forced sterilization and her failed goal of merging with the Eugenics Society. 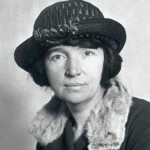 Today, we are told that Sanger was a product of her day and that her attempt to have the “unfit” sterilized, the “feebleminded” shipped off, or her radical suggestion that couples be forced to get a permit from the state to have children (she wrote: “No woman shall have the legal right to bear a child, and no man shall have the right to become a father, without a permit for parenthood“) had no lasting impact on the organization she founded, namely, Planned Parenthood. Samuel W. Anderson was a member of the American Eugenics Society and served on Planned Parenthood Federation of America’s Board of Directors. CP Blacker was Secretary to the Eugenics Society and Vice Chairman of the International Planned Parenthood Federation (IPPF). Mrs. Dorothy Brush was involved with the American Eugenics Society as well as the International Planned Parenthood Federation. In 1948, The Brush Foundation provided seed money to help establish the International Committee on Planned Parenthood (ICPP). In 1952, the organization opened its headquarters in London, England. 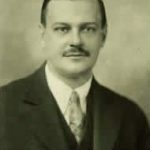 C. Lalor Burdick was a member of the American Eugenics Society and served on the Board of Directors for Planned Parenthood Federation of America (PPFA) and PPFA’s World Population Emergency Campaign. Mrs. Edward (Hilda) Cornish was not only a member of the American Eugenics Society, she was also an officer of the Arkansas Eugenics Association (later the Arkansas Eugenics Association, which would become the Arkansas State Affiliate of Planned Parenthood). Despite her direct connection to eugenics organizations, Cornish was named Arkansas Planned Parenthood’s executive director. 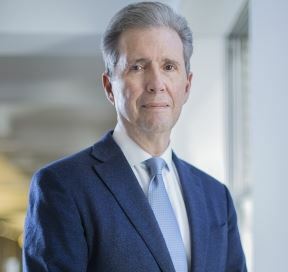 Robert L. Dickinson was a Vice President of Planned Parenthood and served on their Board of Directors. 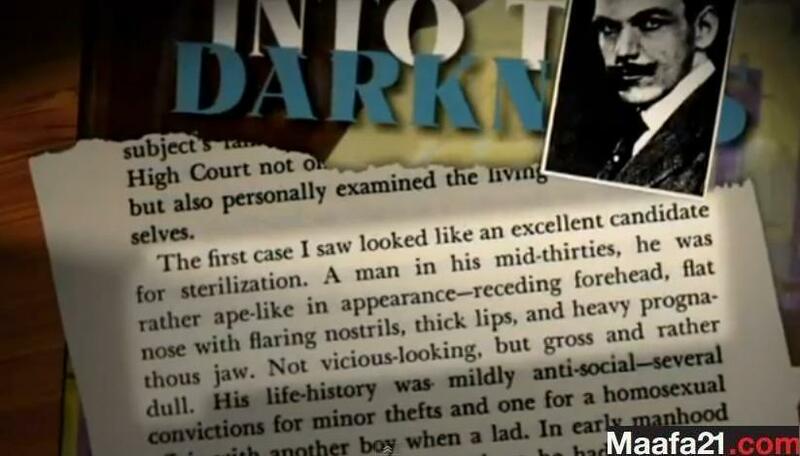 However, his eugenics ties were as deep as Sanger’s. In fact, he was a member of the American Eugenics Society as well as a committee chairman for Eugenics Research Associationevent. Dr. Haven Emerson was on the Board of Directors for the American Eugenics Society and served as a Chairman of Planned Parenthood Federation of America. Emerson was also a member of their National Medical Council. 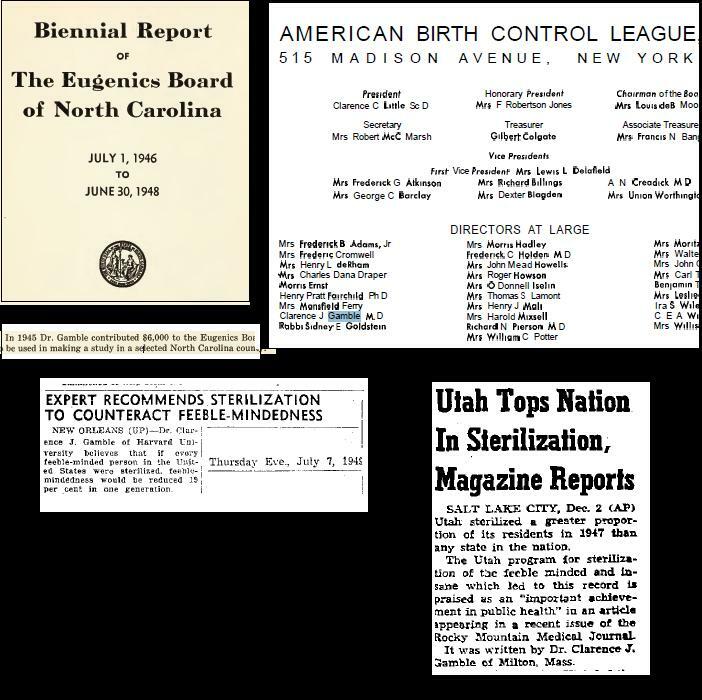 In addition to those who officially served as leaders of Planned Parenthood who had direct ties to eugenics (too many to name here), there were others who were accepted with open arms despite their eugenics history. Professor Frank Lorimer was part of the Eugenics Research Association and served on the editorial board of the Eugenics Quartlerly. Despite his eugenics connections, he represented the Planned Parenthood Federation of America at various meetings. In the 1930s, Dight joined the Minnesota Birth Control League, the forerunner of Planned Parenthood of Minnesota. Frederic Osborn once wrote, “Eugenic goals are most likely attained under a name other than eugenics.” Osborn was a founding member of the American Eugenics Society who signed Margaret Sanger’s “Citizens Committee for Planned Parenthood,” published in her review in April of 1938. Some speculate that Planned Parenthood’s infamous slogan “Every Child a Wanted Child” may have originated with Osborn. 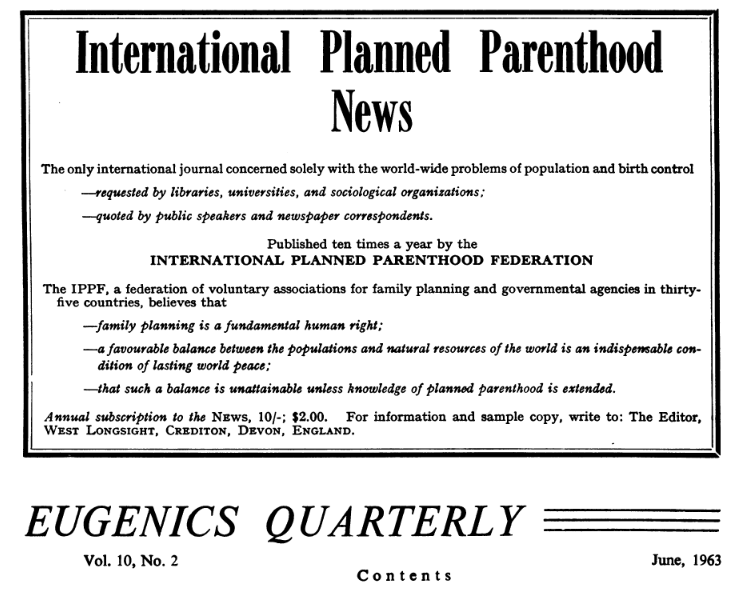 In 1958, Planned Parenthood was still cozy with eugenics leaders. 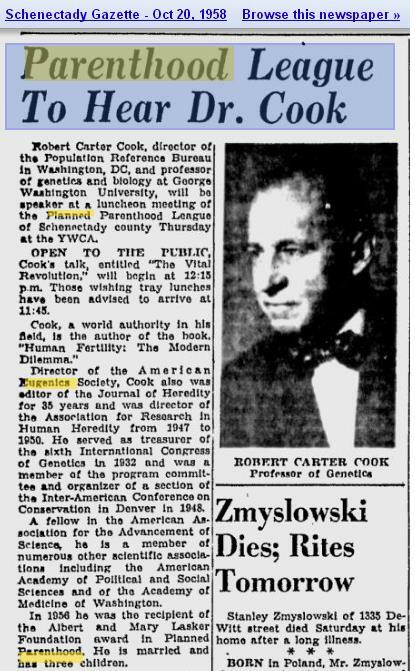 In the article pictured right, we learn that the Director of the American Eugenics Society, Robert Carter Cook, was invited by Planned Parenthood to speak at their lunch in 1958. 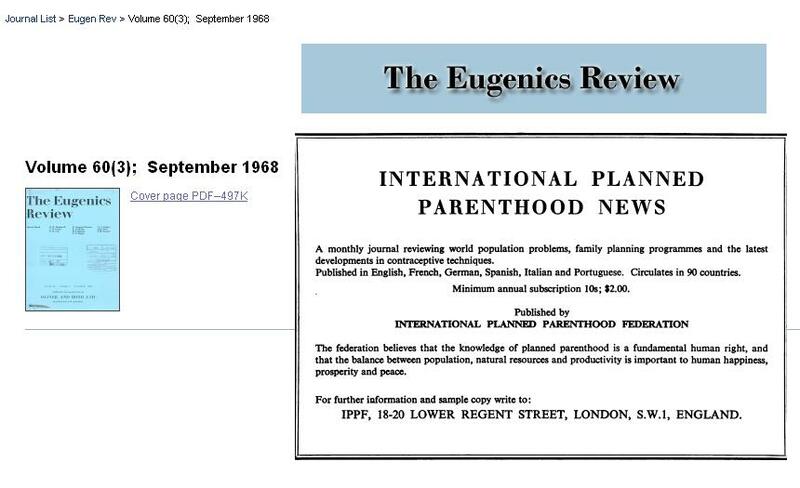 In addition to Planned Parenthood leaders who had connections to eugenics, the International Committee on Planned Parenthood (ICPP) maintained by PPFA among others, received free rent from the Eugenics Society, according to the Eugenics Review. ICPP was replaced by the International Planned Parenthood Federation (IPPF) in 1952. Does this sound like an organization that wanted to distance themselves from eugenics? In conclusion, a unanimous vote of thanks was moved to the Eugenics Society, which has continued during the past year to make available, rent free, accommodation to the International Committee on Planned Parenthood. This was confirmed by former Planned Parenthood chairman CP Blacker MD, who told an audience at the Fourth Conference at the International Planned Parenthood Federation in 1964, that while he was secretary of the Eugenics Society they gave Planned Parenthood office accommodations rent free. In summary, it is evident that from its inception, Sanger founded and nurtured Planned Parenthood in eugenics — and denying what is plain to see will never change that fact.